I’m not religious in the formal sense of the word, perhaps because I don’t identify with the belief that humans are above other animals. 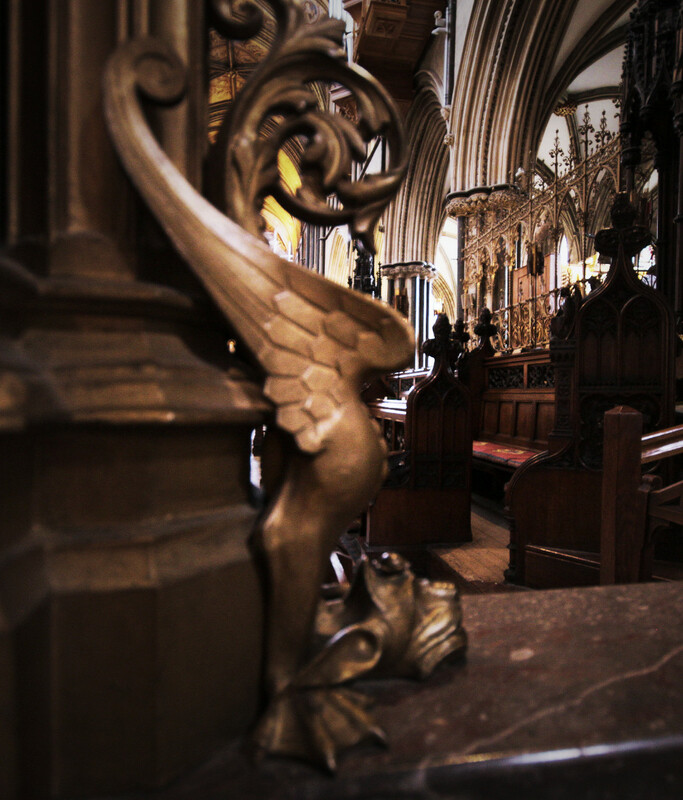 However, I do love the atmosphere and beauty of churches and cathedrals. If, for a moment you brush away all of the grown up history of religion, cathedrals are the ultimate community built artifacts. Crafted over long periods of time, by a connected community of diverse passionate makers with a common goal, to make a monument to the mystery and wonder of life. They are purposeful castles. 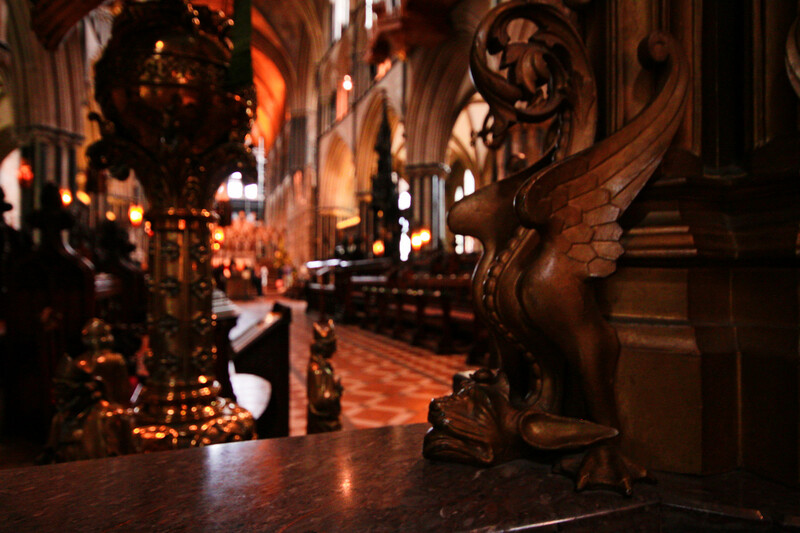 Wandering around Worcester Cathedral today, and finding dragons was magical. My seven year old daughter described the place as “enchanted” and this, I think, is the perfect expression of what we feel when we delight in the artifacts that other people make. My four year old son burst into uncontrollable sobs as the organist started playing and calm music flowed warmly through such a cavernous space. “It’s sad music mummy”. My husband sang in the choir here when he was young, and it made me wonder about the impact such a beautiful space has on belief. Is part of the enchantment of belief about being in this space? If I had heard voices raised in song here when I was young, like my son’s instinctive emotional reaction, would I feel more drawn to identify as religious, instead of spiritual? People and animals – we are all are makers, all to different degrees, and whether we are buildings houses, nests or dens, these built shelters, are our shrines to thinking, dreaming and imagination. Buildings made for any gods tell us, people had passion and wanted to make something that would tell a story, in thousands of voices, for anyone willing to read their own way passage through its nooks and crannies. 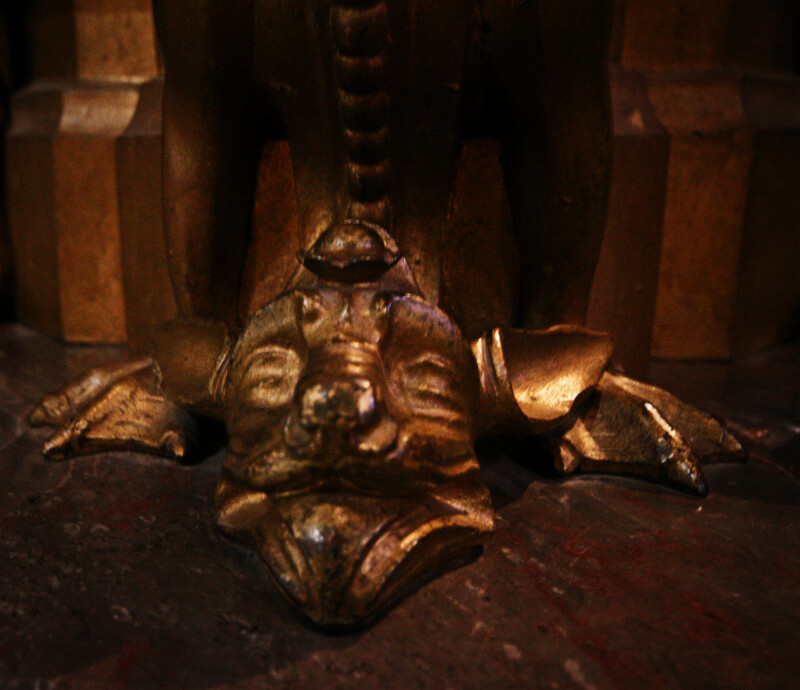 You have to get down low and look close sometimes in ancient places to find the secret guardians. Every corner has a beastie. 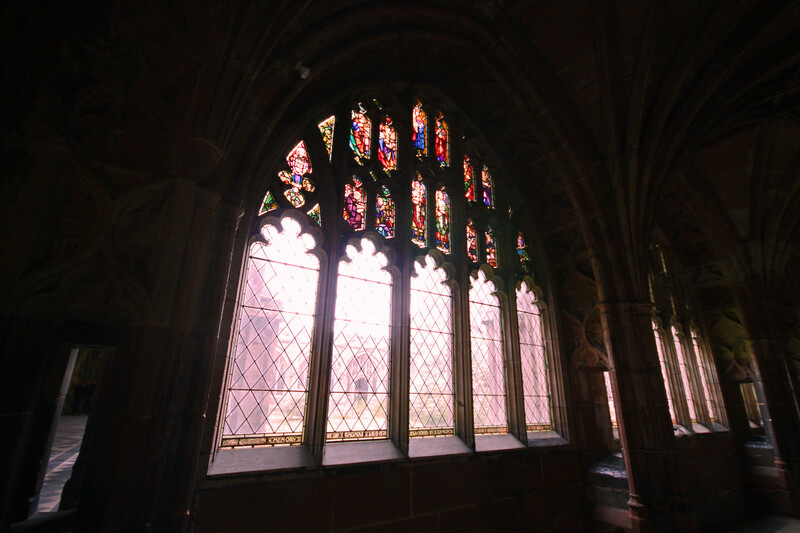 Easy to miss as you gaze at epic light from stained-glass windows, but hands carved these beats with love and a craftsmanship that deserves our pause and notice. 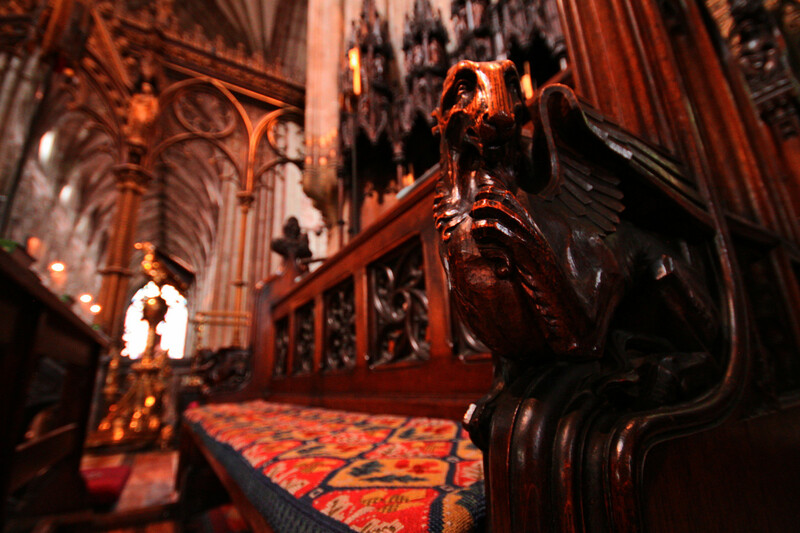 Watching over empty choir seats. 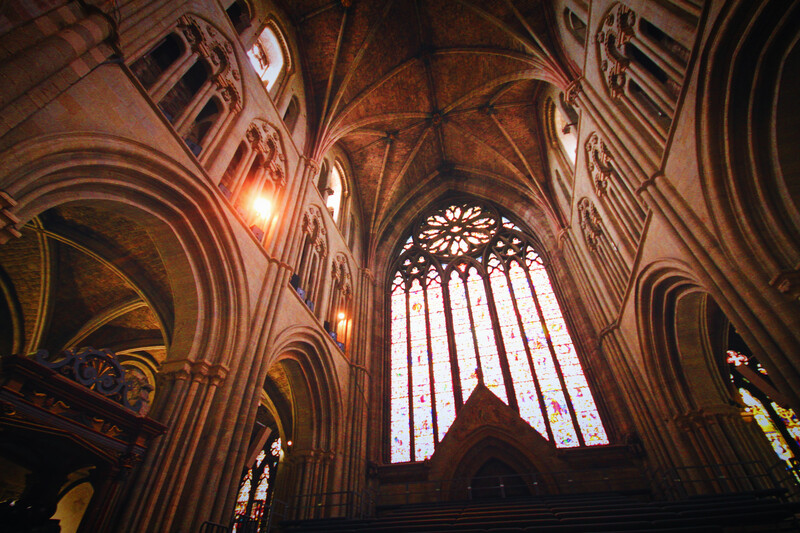 The epic south window, the beautiful colour and detail is lost here but the warmth of the cathedral and ornate ceiling wrap around it with their own towering majesty.